Looks at the major responses from Keynes’ critics, highlighting how they—ironically—participated in and actually strengthened the process of transforming economics into a moral crusade for the satisfaction of consumer appetites, while claiming to be morally neutral. The Austrian economists failed to challenge the core anthropological principles Keynes had laid out, while Milton Friedman and the Chicago school affirmatively embraced those principles. 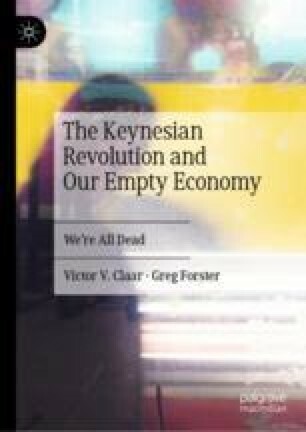 Both schools conflicted sharply with Keynesianism at the level of policy, but that very conflict had the effect of reinforcing the Consumption paradigm anthropology that was embraced or at least acquiesced in by all parties. EconStories. 2010. Fear the Boom and Bust. https://www.youtube.com/watch?v=d0nERTFo-Sk. Accessed 31 Jan 2019. Franklin, Benjamin. 1748. Advice to a Young Tradesman. July 21. https://founders.archives.gov/documents/Franklin/01-03-02-0130. Accessed 28 Jan 2019. Kirzner, Israel M. (undated). Another Look at the Subjectivism of Costs. Working Paper. https://history.fee.org/media/2632/1290-another-look-at-the-subjectivism-of-costs.pdf. Accessed 28 Jan 2019.